We are going to step inside the Lloyd House: An ICF project showcasing the resiliency and versatility of BuildBlock ICFs. This project was a flagship project for Lloyd Concrete Services and BuildBlock of Central Virginia. The natural beauty of this lot inspired the homeowner to make as little impact on the environment as possible.The efficiency of the ICF wall system in addition to the geothermal heat pump are expected to drastically reduce the carbon emissions over the life of the home. Utilizing online CAD details and the Prescriptive Method, the home owners easily designed this home to the highest standards of efficiency and sustainability. For instance, in the basement they reversed the brick ledge form to create a bold crown molding look. 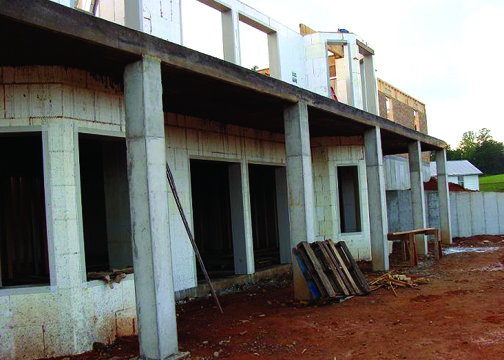 ICF walls facilitated the use of elevated slabs in the design. One foot offsets on front walls required the ICF install team to carefully align and pour the system to meet exacting design specifications. 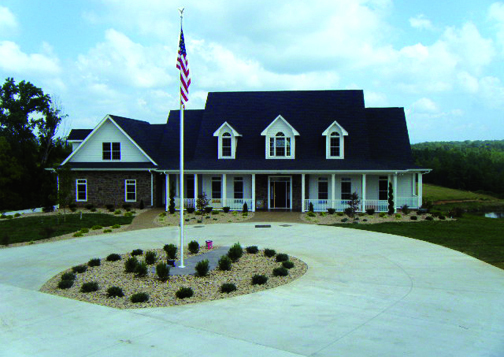 As a flagship project for Lloyd Concrete Services, the Lloyd’s capitalize on this by demonstrating how well their company’s concrete pump trucks and ICF wall systems integrate to create a superior dwelling without compromise to aesthetics. One foundation level, brickledge was turned inside on the top course to serve as a good ledge to rest the floor system on. When it was finished it gave the basement a similar look to a tray ceiling. The wide door and window jams lent itself for some creative trim designs for interior and exterior finish. Two, two-story bay windows were done using 45 degree blocks. A 1′ offset in the front wall presented some challenges in forming since our block is 13″ wide, had to take careful measures in forming and pouring the offset. 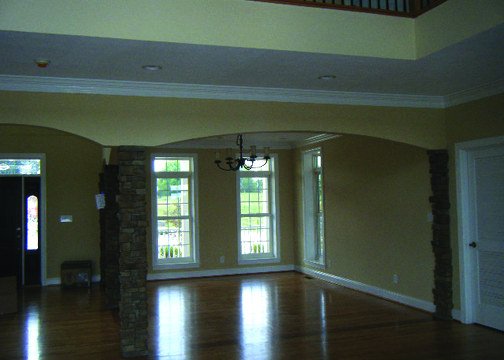 Many LVLs and beams were used in the floor and roof system for all open spaces in the design of the home. Changes from original blueprints made for some on-site engineering. We made a lot of recessed panels and fluted trim to show off the wide window and door jams. The recessed panel theme was carried out in the porch columns in the front and rear of the home. The distributor’s company in conjunction with the Lloyd’s, managed day to day aspects from design to completion. The benefits of combining the homeowner’s vision and the distributor’s technical aptitude contributed to this technical build being completed on time and on budget. The ICF walls were the most viable solution to accomplishing design feats such as elevated slab balconies and suspended concrete spiral staircases. The wall system easily integrated with exterior finishes allowing the home to blend seamlessly with the natural landscape. Early in the design process ICF was chosen for its sustainable nature so they were included in the initial budget. 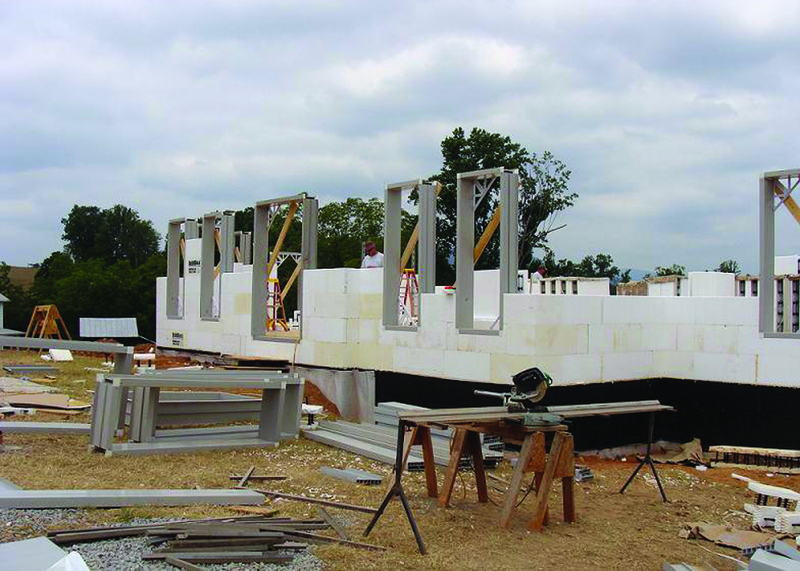 The speed and ease of ICF construction contributed to lower construction costs. A week after our block was delivered and stacked on the job site a 70mph windstorm came through and blew half of our ICFs into a pond that was over 200 yards away (luckily they float). When the forms were re-stacked, it was too close to a fenced in area that is when we learned the hard way that cows like the taste of ICFs and ate as much as they could reach through the fence. Fortunately, EPS is non-toxic and no animals were harmed! 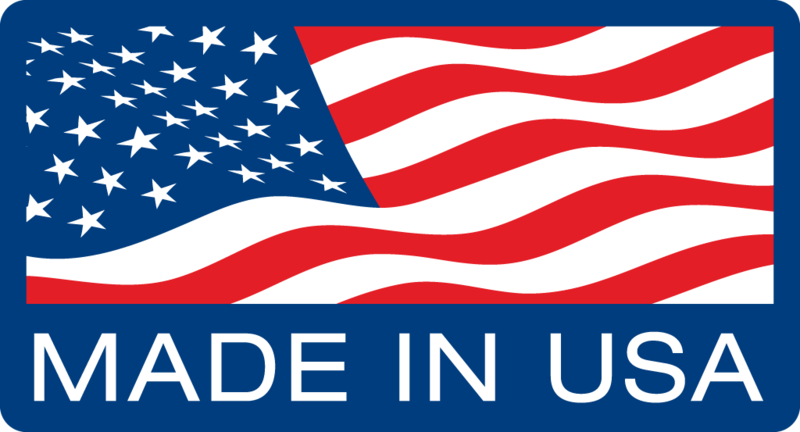 Because Lloyd’s Concrete Services sets the standards for quality concrete work and innovation when he decided to build with BuildBlock of Central VA it was a big boost for our company in our area. It was also the first ICF walls that Bedford Ready Mix had ever poured. 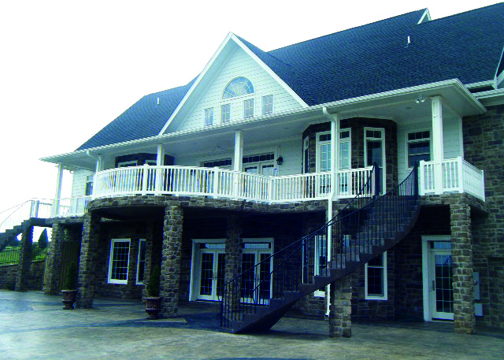 This home was a beautiful example of the versatility of ICFs with a patio, balcony, spiral staircase, and in-ground pool. The magnitude of this project as it relates to concrete construction stands to vanquish misconceptions that concrete building restricts creativity. By combining the sustainable wall system with the natural beauty and benefits of conventional and non-conventional concrete methodologies, this home exemplifies the finer points of concrete construction in every aspect. The owner, Lloyd’s Concrete Services owns the pump-trucks that we use for our ICF walls. There was already a working relationship and he was impressed with the ICF concept. Mr. Lloyd is an ACI board member and is very familiar with concrete. We invited him to see one of our pours at one of our other projects and from that point on he was convinced to use BuildBlock ICFs for his own home. 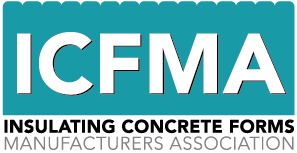 As a board member of the ACI as well as a Board of Directors member for ASCC, the homeowner has used the positive outcome of this project to influence concrete professionals to better understand and embrace the benefits of ICF technology.